Unlike other manual sweepers, the Haaga's special circular brooms grab dirt that's directly in front of the machine. There's no center wheel or rubber lip to get in the way of cleanup. The side brooms pull dirt from corners and crevices, getting it off the street and into the garbage, where it belongs. Even leaves, cans, cups, large debris, sand and stone are whisked away by the TURBO?s powerful brushes. The second step is a special pass by the unit's roller brush. The brush hurls dirt overhead, catching it in the refuse container. This second brush eliminates the need to make several passes over the surface. 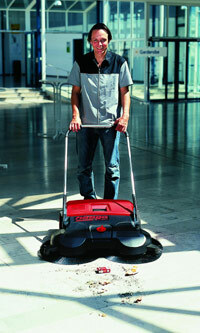 It grabs and removes the finest dust particles quickly and efficiently. The TURBO provides optimal cleaning performance and a large hopper for fewer stops and dumps. All parts are recyclable, and replacement pieces can be snapped in without the use of tools. Ideal for parking lots, warehouses, greenhouses, gas stations, and supermarkets. The Haaga 400 Professional Line Series is improved for better handling and sweeping performance. Pros Know:: the right tools save you time and money. The Haaga Push Sweeper is the revolutionary back-saving, time-saving tool for quick and thorough sweeping without sweat and effort... just push and clean. The Haaga is a versatile machine, working inside or out and in wet and dry conditions. The patented dual brush design easily picks up all sized debris including cans, paper, nails, broken glass, dust and stones. Thoughtful and high quality German engineering insure the Haaga will be a long lasting tool you will use often. Brush pressure easily adjusted to allow for various surfaces, indoors or outdoors. Protruding polyamide brushes on both sides rotate inwards depositing debris into the large built-in bin. 4 year wear and tear warranty for the brushes. works by Push powered. Turbo sweeping system. Two counter-rotating discs. Push powered. Turbo sweeping system. Two counter-rotating discs plus center brush roller. Push powered. Turbo sweeping system. Two counter-rotating discs plus center brush roller. sweeping width 29.5" 30.3" 40"
Hopper size Bigger hopper allows more debris collection. Bigger hopper allows more debris collection. Bigger hopper allows more debris collection. Best for Best for semi-professional applications in large areas. Best for semi-professional professional applications in the largest areas. Best for semi-professional professional applications in the largest areas. Suitable for all types of large and small debris. Indoor and outdoor use. all types of large and small debris. Indoor and outdoor use. all types of large and small debris. Indoor and outdoor use. All Haaga Professional push sweepers include a 4 year wear and tear warranty on the brooms, and a 2 year guarantee on all other parts.